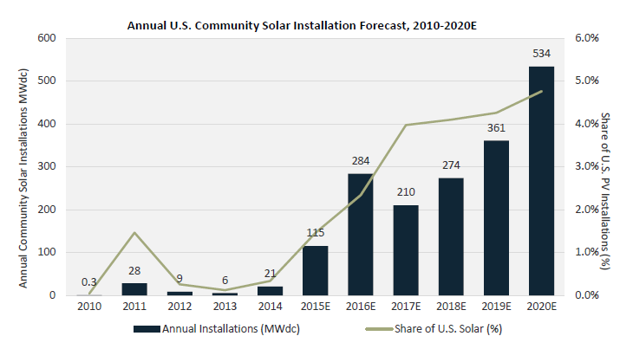 Community Solar Offers Alternative That Utilities Like ….. If rooftop solar is the clean-energy threat to utilities, then community solar farms are the middle ground traditional power companies can live with. Both produce electricity that utilities are required to buy under state incentive programs. And as the two models become more popular, they’re becoming a growing drag on revenue. The key difference is that community solar developers also invest in local power grids, helping share the cost of upkeep that’s become a significant complaint about the burgeoning rooftop power industry. As the industry seeks new ways to incorporate clean power without too much disruption to incumbent utilities, having their support will be important, and it’s a major topic of panel discussions at the Solar Power International conference that began in Las Vegas Monday. The idea is starting to garner a lot of attention from regulators and executives even though it’s still a tiny slice of the U.S. energy market. “Utilities begrudgingly support community solar,” said Paul Spencer, chief executive officer of Clean Energy Collective LLC, a Louisville, Colorado-based developer of these small power projects that are owned by consumers. Community solar farms are typically small, ground mounted projects located near the people who will use the power. They’re often owned by consumers, who buy fractional stakes and get a credit on their utility bills based on the amount they own and the amount of power that’s sold. “Our members are definitely interested in community solar,” said Richard McMahon, vice president of energy supply and finance at the Edison Electric Institute, a utility industry group in Washington. Here’s why: Utilities make money from operating power grids and supplying power through their lines. When a house goes solar, it uses the grid less and pays less to the utility. The resident typically becomes a customer of the solar company, limiting their involvement with the utility. With community solar, the owners remain customers of the utilities. And because the projects rely on the grid to deliver power, developers have an incentive to support the infrastructure. For example, Clean Energy Collective invested $15 million to upgrade utility substations near its projects in Massachusetts. Hannah Masterjohn, director of new markets for the developer, estimates that the 326 megawatts of community power plants now planned in the state may provide $60 million for grid improvements. That arrangement “benefits the distribution system as a whole,” she said in an interview. In many cases, utility customers are driving demand for solar. “It’s about providing options our customers want and being cognizant of any cross subsidization that causes,” said Lee Gabler, director of customer strategy and solutions at Xcel Energy Inc. The Minneapolis-based utility expects to have 400 megawatts of community solar online in Minnesota by the end of the next year, at least 40 megawatts in Colorado and 2 megawatts in Wisconsin. “Clearly community solar farms are going to be a much larger presence,” he said. Community solar undermines utility arguments that net metering policies mainly benefit high-income homeowners who can afford to install panels on their roof, disproportionately shifting grid-maintenance costs to the less wealthy. 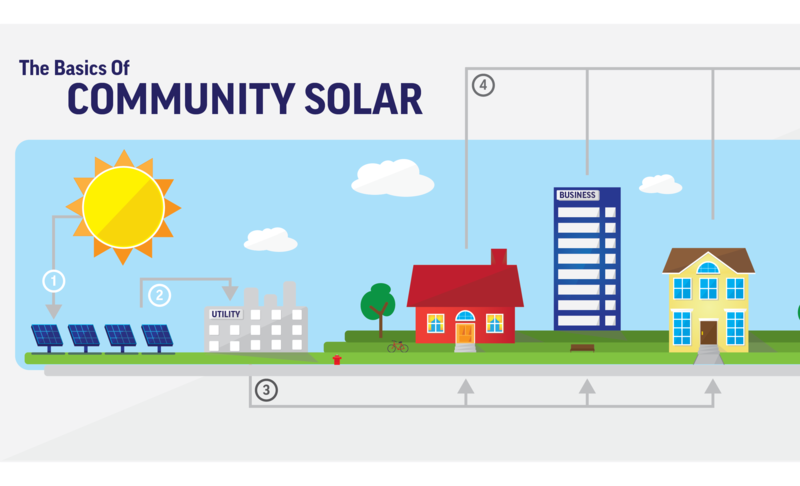 The market for community solar could eventually exceed rooftop solar and giant desert solar farms because it can supply low- to moderate-income renters, multi-unit apartment buildings, and homes and businesses with unsuitable roofs. That could reach 750 gigawatts of demand, according to GTM Research. Solar is a rapidly growing industry employing over 230,000 Americans and serving over 1,000,000 customers nationwide.